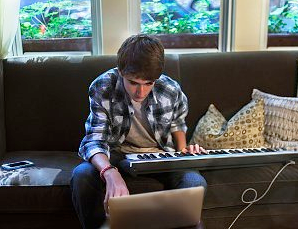 Is it possible to learn to compose music or is it only a gift you possess or do not possess ? This question is probably worrying more than one musician or beginner. Music must seem strange or mysterious to those who only know music by listening and appreciating it. How to line up notes, rhythms and chords to create such a harmonious set of sound ? Then you say to yourself you will never get there. STOP ! Such an attitude is just the same as asking yourself why you can not write Japanese poetry if you never learned Japanese. It is a matter of steps : to go up the ladder, you start on the first rung, not on the tenth (which would also seem impossible to reach). The musical creation work itself : your career as a composer, including learning how to disseminate your music and make your compositions known. I don’t mean that to compose you necessarily need to learn or master all these points. Not at all. But someone who would study a practical, complete and progressive method based on all 10 points above could not help but really publish his own CDs, no matter how not talented he was before beginning. The purpose of ARPEGE is to create such a method, the Pizzicato software being the tool to reach it. You can assume that if you really want to compose something personal and that would be well received and really have success, you will need to put the expected effort on it. The easy way does not exist. You need to work on it and persevere. Stable successes are based upon work and a full understanding of the subject, like in any other areas. It all depends on the goal you have. Is it to entertain yourself, to impress friends, to really understand music, live it and create it, to expresse yourself through it and in full knowledge, to publish your own CDs, to become a professional composer ? Each goal is possible and valid. Just be honest to yourself : what is your goal ? Then apply the necessary method to reach it. The point is, if you know nothing about music and you really want to become a composer and successfully publish your CDs, do not expect to reach that with a “magic wand”. An important work is waiting for you. But the path and the results will be of high value to you : you will understand music and will be able to express yourself with it. The “Professional” or “hobbyist” aspect does not necessarily enter into consideration, because even a hobby can be practiced with the greatest care. The real question is “How much do I want to understand music and create my own music ?”. By using an easy and/or automatic composition software, you will enjoy it, you will be able to learn music and make some nice personal compositions. Such softwares may bring you a lot of things. But don’t expect the result of it to become number one in the charts or to be selected as the music of a success film. You may also envision things by steps. Your goal may increase with your knowledge. If in the beginning you only want to better understand music and entertain yourself, do just that. If you get more involved in it, increase your goal and study music further. Our long term project is to give you the possibility to reach those goals, with tools contained in Pizzicato (present and future releases), with more progressive, personal and specific music courses. We saw the various possibilities offered by a sound card, as well as the methods used to generate sounds. While working with a MIDI software (like Pizzicato), it is useful to select, collect, handle and play instruments sounds with which you want your scores and composition played. How ? I suggest the use of the SoundFont standard, created by the Creative Labs and Emu companies. It is a well known sound format and you can find lots of sound libraries, some free and some to buy. Let’s see the practical steps to select your sounds, create a bank and assign them so that Pizzicato can play your scores with your sound selection. The first phase is to select your sounds. This needs to steps : find sounds and listen to them. 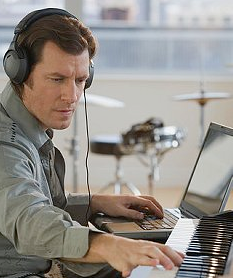 To find sounds, use your prefered Internet research tool (Google, Yahoo, Msn,…) and enter keywords “Free SoundFont”. You will rapidly find numerous sites with SoundFont instruments and effects. Some are good, some are bad. You must then listen to them and test them. For this, you can use the Virtual Sampler 3 software. You can download its demo version at http://www.maz-sound.com/index.php?show=product&id=2 Once installed, you may open a SoundFont file and listen to the sounds with a musical keyboard displayed on the screen. When installing the software, specify that you want the “Speedsoft Midi Cables” installed. With them, Pizzicato will be able to send the notes of your score to Virtual Sampler 3. These “virtual cables” may then be selected in the Pizzicato Option menu, Midi Setup… and set in the MIDI output. Start Virtual Sampler 3 and click the “sf2” button in the middle of the screen. The next step is to assemble those sounds into a personal sound bank that can be used by Pizzicato (or by any MIDI software). The idea is to take each sound you have individually selected and create a unique SoundFont file (.sf2) that contains them all. For this purpose, you may download the free software “Vienna SoundFont Studio 2” on the Creative Labs site at (http://www.soundfont.com/downloads.html ). This software lets you create a sound bank and fill it with sounds from various other banks and then save them in one unique file. The main problem is the correspondance between MIDI and the created SoundFont file. The Vienna software lets you assign a Preset number (0 to 127) and a bank number (0 to 127). First assign all sounds to bank 0 and for the preset, respect the General Midi numbering (you can find the list at http://www.bluemax.net/techtips/Midi/Midipatchnum.htm but be aware that some user interfaces use a number from 1 to 128 and some others between 0 and 127; subtract or add 1 accordingly). For instance, if you find a good violin sound, assign it bank 0 and preset 40 (41 minus 1 for the violin, see the list). In this way, you stay compatible with General Midi and the MIDI files you create or open stay standard on the sounds used. If you create an extensive sound bank, for instance by adding 10 different violin sounds, keep the same preset but use other values than 0 for the bank number, while keeping the 0 bank for the default violin. While doing this, write carefully on paper the sound table (preset, bank and instrument name), because you will need it to create a compatible synthesizer for Pizzicato. To use the Vienna software, read the help section of the help menu. This program also helps you to create Sound Font files starting from any Wav or mp3 file. Once your SoundFont file has been created, you need to play it with Pizzicato or a MIDI software. If you have a recent SoundBlaster card (from AWE 64 up), you may use the utility program of the card to load your sound library into the card, because the card has an integrated SoundFont player. For details, see the documentation and the online help of the card (Start, Program, Creative) to know how to load a file into your card. If you do not have a SoundFont compatible card, you may use a SoundFont player software. Virtual Sampler 3 does this, but there are others too. Search for them on the Web with expressions like “SoundFont player, SoundFont reader”. In any case, the software must give a direct MIDI link, i.e. adding a MIDI output port in Windows so that it can be used by Pizzicato or any MIDI software. In Pizzicato, the last step is to select the MIDI output (Option menu, Midi Setup…) which corresponds to the SoundFont compatible card or to the MIDI output going to the SoundFont player software. For the Pizzicato Light and Beginner versions, the only possible synthesizer is the General Midi, so you need to respect the General Midi preset numbering as exposed here above. Fot the Professional Pizzicato version, you may create a new synthesizer which answers to the various sounds assigned to the non zero bank instruments. Refer to the lesson on synthesizers on the screen help or on our site at page http://www.arpegemusic.com/manual/EN630.htm Use the list you have prepared while selecting your sounds in Vienna. The use of the various softwares renders the task more complex and what we described here is not a simple procedure. We envision tools to create your personal SoundFont files so that Pizzicato may handle itself this sometimes complicated task of assigning presets and banks. This article was designed only to give you the main steps of the process so that you can personalize your sounds and use them with Pizzicato. Concerning sound banks, if your needs are high regarding the orchestral instruments quality, you may orient yourself to the EW Symphonic Orchestra software which contains an impressive quantity of orchestral recorded samples. The software exists in various versions between 300 and 3000 $US. You may find information at http://www.soundsonline.com/sophtml/details.phtml?sku=EW-161 The demo files show the quality of the sound result. It seems that the software uses a personalized sample player and needs a powerful machine. Approaching music composition is a goal that lots of musicians or non musicians would like to realize. Is there a systematic method which, if followed to the letter, would make it possible for a person to compose? Musical inspiration is not really explained by theory. It is simply the creation or combination of sounds in an original way, with a specific goal or simply for fun. If the result is appreciated by others, those can always try to explain why it sounds well, why it is well built, etc. But this “afterwards” explanation can be misleading, because one could conclude from it that the musical work could have been deduced from the theoretical explanation, whereas it is the reverse that occurred. If it was only related to logic (whereas it is related to esthetics above all), it would be all right to assemble all musical theory rules and integrate them in a software. The computer would then be able to have inspiration. Unfortunately, its “inspiration” will be limited to copy, modify or combine the inspiration of those who, by their esthetic sense, succeeded to really create and whose works allowed to deduce rules of musical theory. Therefore, do not fall into the trap: inspiration is above theoretical rules. In other words, if you like some measures of your musical composition, keep them even if these measures do not satisfy any theoretical rule at all. The process of music evolution is thus the following: inspiration makes it possible to create musical works. When these works are appreciated, people deduce from it some theoretical rules or musical construction systems. Then these systems and rules are studied by others. Where the latter fail, it is when they think that they will have the inspiration only by studying these systems of logic. They forget to place their share of esthetics in it, the essential source of musical inspiration and sound effects. Do not fall either into the opposite trap of rejecting all rules. Rules can guide you, especially when you lack experimentation in composition. One could look at music as a succession of distinct, small or great sound effects, assembled to form a more global sound effect: a musical work. For example, the passage from a G7 chord to a C chord: it is a sound effect in the field of combination of several sounds. It produces a sound effect that the ear generally appreciates and it produces a specific atmosphere. Similarly, each sequence of two chords is a sound effect. The use of such or such rhythm is a sound effect. Combining two instruments creates a sound effect. Each one of these small effects can combine to create a larger sound effect, which is then characterized by a specific personality. A melody is only a set of notes in a specific rhythm sequence, each one being a specific sound effect. The combination forms a melody, recognized among all others. 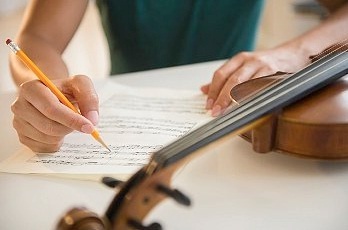 Thus music is a construction of sound effects sufficiently personalized so that a piece is unique and distinct from the others, while communicating what its composer wished to communicate. The spirit of composition is thus to create sound effects to express something. Any method which produces that is a valid method. If a musician plays by ear and if, by research and work, he methodically manages to isolate the various sound effects of his instrument and if he can then selectively produce them in a sensible way according to what he wants to express, then one can say he composes music. The sound effects can be located in various ways. Listening to lots of music with an attentive ear will help you. But to do only that is likely to make phase 2 very difficult, even impossible, because you still cannot connect the sound effect to what you need to do to produce it. 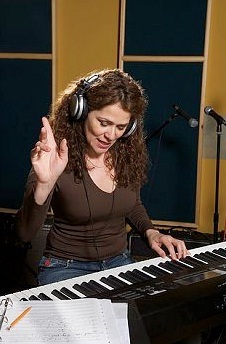 The practice of an instrument will be complementary, because it lets you associate the desired sound effect to the technique to produce it. Listening and playing will give you basis for inspiration, but you also need some ability to synthesize and listen so as to mentally classify and integrate the various effects your instrument can produce. Phase 2 is more active. 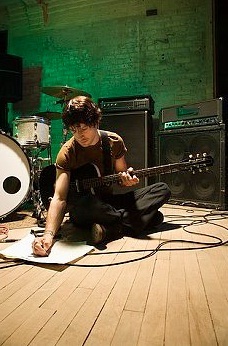 It implies that you have something to express, to write into music. You can start from almost anything (an emotion, a landscape, an idea, an atmosphere…). Then the trick is to find, in the sound effects you assimilated, the right combination that expresses your message and which is specific to you. It is your capacity of choice and creativity. Phase 3 requires more experiment and comes gradually. It concerns the ability to develop a coherent work, where every element goes well together. It is the link that will bind the ingredients. One needs a link between the various passages of your work. This link can be rhythmic, melodic or be based on combinations of sound effects. 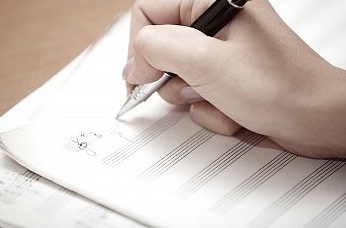 Start with relatively short pieces before writing a whole symphony. These three phases are interdependent. Only the practice of composition will help you to refine these three phases. The purpose of any musical rule should be to help the composer to combine sound effects while helping him to free his musical imagination and stimulate his inspiration. Three types of rules could be met, corresponding to the above described phases. And the software tool can be very helpful in this direction. The current version of Pizzicato music software (see http://www.arpegemusic.com) already offers various tools. The next versions will continue in this direction, the goal being to help you to compose.